১২ জুলাই অনুষ্ঠিত হয় ক্যাম্পাস পরিচালিত ইংলিশ এন্ড স্মার্টনেস কোর্স ফর লিডারশিপ এর ২৪তম ব্যাচের উদ্বোধনী অনুষ্ঠান। এতে প্রধান অতিথি ছিলেন বরেণ্য	বিস্তারিত..
মার্চ অনুষ্ঠিত হয় ক্যাম্পাস পরিচালিত ফ্রি সেমিনার অন প্রোএকটিভ এন্ড পজিটিভ এটিচিউড এর ৩৩তম পর্ব। ক্যাম্পাস অডিটোরিয়ামে আয়োজিত উক্ত সেমিনারের বিষয় ছিল Know Thyself. অর্থাৎ নিজেকে জানো। শিক্ষা ও যুব উন্নয়নে নিবেদিত প্রতিষ্ঠান বিশ্ববিদ্যালয় ক্যাম্পাস পত্রিকা	বিস্তারিত..
১২ সেপ্টেম্বর অনুষ্ঠিত হয় ক্যাম্পাস পরিচালিত শিক্ষানবিশ কর্মসূচির সনদ বিতরণ অনুষ্ঠান। ক্যাম্পাস অডিটোরিয়ামে আয়োজিত এ অনুষ্ঠানে ২০১৭ সালের শিক্ষানবিশ কর্মসূচিতে নেতৃত্বদানকারী দক্ষ লিডার, কো-লিডার, বেস্ট পার্টিসিপেন্ট এবং	বিস্তারিত..
Campus works to build a developed country, free of corruption & terrorism by enhancing social awareness. Campus develops & prints sticker, leaflet, calendar, desk-slip etc. containing variety of messages for social welfare & advancement. Those are distributed throughout the country. In order to develop skill and practical knowledge among students & youths, Campus has initiated this Program. The philosophy of the program is "earn while you learn; increase smartness, honesty, sincerity, leadership, matching capacity & perfectionism in life”. This program is running regularly since 2004 to establish transparency, accountability & good governance in the society by expanding computer technology. More than 4000 students & youths have been trained in computer & IT at free of cost. In addition they have received training on hardware-software & troubleshooting. As English is an international language and it has its own importance, Campus has launched this dynamic program to build smart & global youth generation. In this course both speaking & writing capacities of the participants are enhanced and they become skilled in English language. 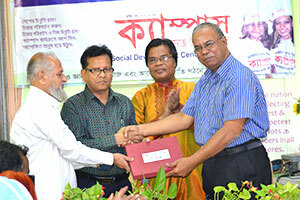 Campus has initiated the program to build a digital & modern Bangladesh. In this program students & youths get various training to be modern & enlightened persons and eventually they become Digital Young Stars. Successful & talented Young Stars are awarded with computers & laptops. This program aims to establish equity, balance & social justice by recognizing honest & sincere persons of the society and cornering dishonest & corrupt. To fulfill this motto honest people are selected with specific & widely accepted rules and they are awarded ceremoniously. The way to achieve success in any situation is to be a person with Proactive & Positive Attitude. Campus regularly arranges free seminars to guide students & youths the process of becoming confident, proactive & positive. Thus Campus is building talented citizens for future. To develop an economically solvent and prosperous nation by the year 2020 Campus Research Cell is conducting various research studies. This cell is working on various national development issues and has already developed two models for sustainable growth of Bangladesh. This is the first ever & leading news magazine on education & youth development in Bangladesh. The main aim of this fortnightly is to bring an end to derangement & decay of education system and to ensure quality education and disciplined educational institutions free from terror, copying & smoking. This program organizes dialogues to discuss & exchange views on contemporary & nationally important issues. Different seminars & dialogues are organized and recommendations are communicated to the policy makers to help them implement various programs and achieve goals of the nation. This program aims to stand by poor & meritorious students and help the distressed people affected by natural disasters. To enhance their welfare Campus organizes programs to collect money & relief materials and distributes them with speed, efficiency & transparency. Campus publishes books on improving thought power & creativity, leading healthy life, improving talents of children & youths, sensitizing nation on optimistic ideas etc. High quality & creative books of Campus Gyanmela Series have already won the hearts of the readers. This is a regular program of Campus to build self-confidence among people and to help them becoming Superior Human Beings. Meditation sessions are arranged at free of cost in Campus Auditorium at 4-30 pm of every first & third Saturdays of the month. Campus also offers longer Meditation Course. Campus believes that youths & students with sound & healthy mind & body can relentlessly & efficiently work for better Bangladesh. To build such citizens Yoga sessions are regularly organized at free of cost in Campus Auditorium at 4-30pm of the 4th Saturday of every month. With the motto of ‘Be Your Own Doctor’ Campus regularly conducts this program, which generally takes place in the Campus Auditorium on 2nd Saturday of every month at 4-30pm. In these sessions renowned experts deliver lectures and give hands on training on various techniques. Campus is conducting this program as an effort to aware to all about the benefits of scientific & easy natural practices & treatments. Under this program various seminars & exercise sessions are arranged on different types of natural remedies such as reiki & apitherapy. Campus regularly arranges free workshops on Digital Society to provide youths with clear understanding of ways to achieve efficiency, transparency & accountability by utilizing information technology. 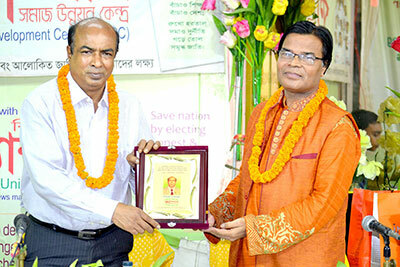 In this way they become ideal citizens of the Digital Bangladesh. For a healthy generation this service is inspiring all to develop a habit to take herbal & natural food & medicine and avoid chemical adulterated food. This program also encourages regular physical exercise & health check up to remain healthy for at least 100 years. This is the first ever web portal of Bangladesh developed by Campus IT. This database contains information of 72 thousand educational institutions of Bangladesh. This portal also contains various necessary information of daily life for different professionals and age groups. Campus is dedicated to build a knowledge based society and enlightened nation by inspiring students & youths to achieve the habit of reading books of different authors other than academic texts. Campus has its own library in Campus office, which contains more than seven thousand books. This program aims to modernize education system and ensure quality education by creating healthy competition among educational institutions. With well-defined rules & criteria 3 best universities and 1 best VC, education entrepreneur & administrator will be rewarded yearly. This Team works for promoting national culture & heritage. Various innovative cultural programs are organized to sensitize people against social injustice, corruption & terrorism through music, dance, recitation. This inspires participants to become vocal against these unfair practices. This program is meant for teaching Chinese language, so that the participants can prosper by utilizing opportunities of rising economic power of China. Knowledge of Chinese enables one to establish trade and investment relations with China as well as get employment there. This forum inspires the youths in patriotism and to create opportunities for participating in development activities. By joining this Forum young people get the chance to improve their skills, knowledge, smartness and vision about life. They also receive pocket-money from Campus. Copyright 2015 Campus IT - All rights reserved.